How much is PSG’s Edinson Cavani worth? According to L’Equipe,Manchester United “have been told” they can sign the Paris St-Germain forward for £32m. This odd story also appears in the Metro. 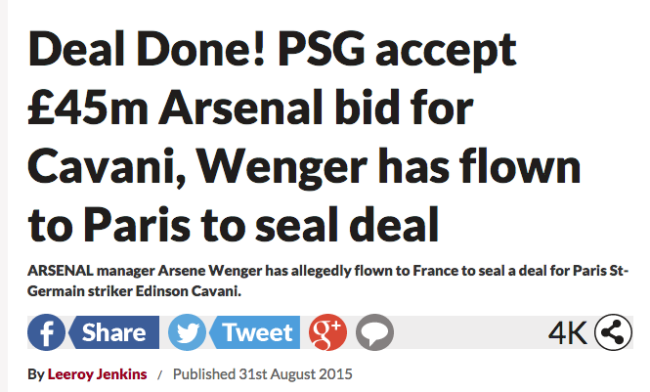 It’s the newspaper that said Cavani had agreed to play for Arsenal. The Metro‘s story of Cavani now being worth £13m less than he was just three months ago contains not a single named source. It’s just an apparent fact that Cavani is worth £32m. And why didn’t Arsenal sign the Uruguayan? The Daily Mirror says the Gunners decided the 28-year-old has ‘no sell-on value’. They should have consulted that anonymous source – although Cavani’s value is falling faster than the Star and Metro’s credibility.